I knew that after months and months of hard work revising for my A Level exams I would most definitely need a holiday, so back in November of last year me and my friends booked ourselves a party holiday in Laganas, Zante. I'd only been out clubbing once before in the UK (as I'm not 18 yet) and the only holiday's I'd been on without my parents before had been organised by my school, so I had no idea what to expect. Now that I am safely back in Britain after one of the best weeks of my life I thought I'd write a blog post giving a bit of advice to those of you who are planning to go on a party holiday this summer! We booked our holiday through Thomas Cook and it was part of their Escapades range so as part of the package we had reps at our hotel who would 'look after us'. When we got to the hotel we were introduced to our reps who were very friendly and showed us to our room. Once in our room we quickly realised these people did not want to be our friends but instead wanted our money, as they forced us to sit and listen to a 30 minute hard sell of all of these parties and events "we had to go to" all for the extortionate price of €210. Feeling pressured we picked out the events we wanted to go for (Full Moon party, Pool Party with Chase and Status, Funky Buddha and a Boat Party) and handed over €145. 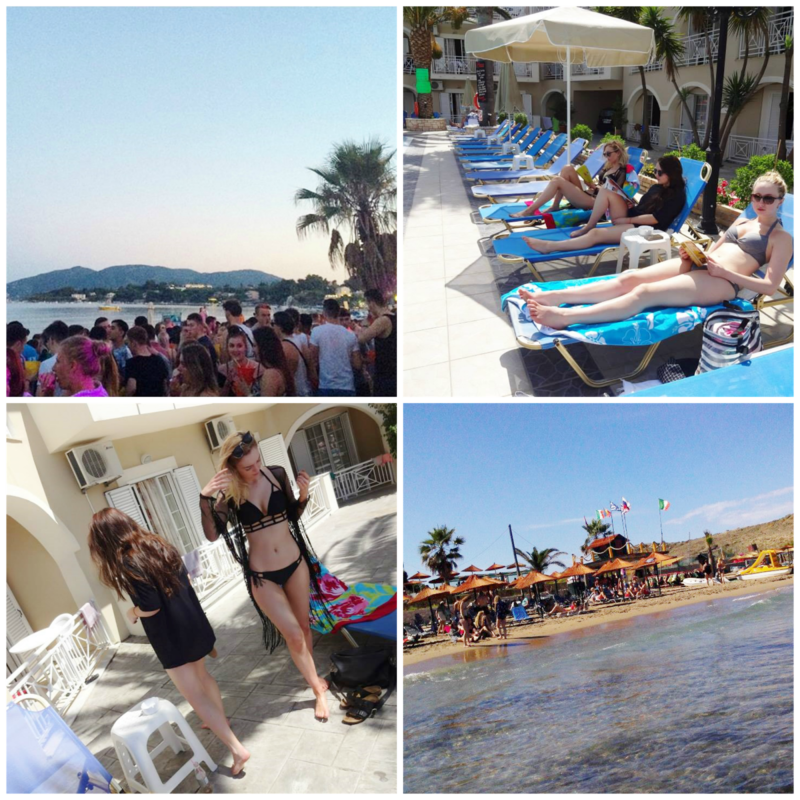 While lots of the events we picked were great others like the Boat Party were disappointing and left us wishing we'd booked the Rum and Ray Ban's Boat Party ourselves. While its convenient to buy the parties off the reps, they make their money through commission so you'll end up paying more, especially when it comes to bar crawls where they will take you to the most expensive bars on the strip. The events and parties were some of the highlights of my holiday, watching Chase and Status in Gaz from Geordie Shore's club Pure was absolutely amazing but would've been a little bit better if we'd pre drank at the hotel bar or in our room before going. At most events it's about €5 for a cocktail while this is still cheap compared to drinks in the UK, for Zante this was expensive when most other places are doing cocktails for €2/€3. When you've already paid about €30 to get into an event you don't want to be spending another €20 on drinks so don't buy drinks at the events. Personally I think that budgeting is important on any holiday you go on as there is nothing scarier than being in a foreign country with no money. I took about €450 to Zante for a week and I came back with about €120 because I was watching what I was spending but some of my friends took about €370 and they'd ran out by the last day because they were spending a lot of money on things they didn't need and would loose money on nights out because they didn't take a bag. On average I'd spend about €20-€30 a day including drinks on a night out, a snack at lunch and a big meal in the evening, but I don't drink that much and people would often buy drinks for me, so depending on how much you plan to eat and drink you may need more. When deciding how much money to take don't forget those one off costs like events, air con, wifi and a safety deposit box. While a lot of people in Laganas were young tourists like myself hoping to have a good time there will always be people whose motives aren't pure. 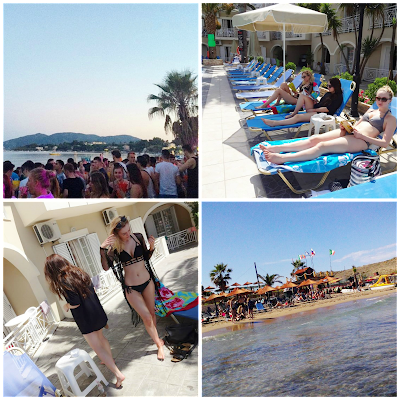 It is so easy in Zante to have your drink spiked or to drink dodgy vodka they serve at rubbish bars. To stay safe on holiday I'd recommend that you never drink at the top of the strip (this is where all of the bars are that pass off paint stripper as vodka or sell recycled drinks), never walk home alone (it is easy to get lost in a new place and people may take advantage of you especially if you're drunk) and don't leave your drink unattended as it may be spiked. Accidents happen and it is likely that at least one of your group will get ill or injured at some point in the trip. When I was away I got bitten by mosquitoes and the bites became infected and filled with puss (gross I know) but it was useful to have some antiseptic cream and dressings to look after the bites until I got home and got some antibiotics. My friends shoes rubbed her to the point where her feet were bleeding so again antiseptic cream and plasters came in handy. While there was a pharmacy on the strip as well as multiple A&E's it was easier to have what we needed at the hotel, so I'd recommend that you take with you paracetamol, ibuprofen, antihistamine, Imodium, plasters and antiseptic cream to help with those common illnesses and injury's. I can honestly say that my week in Zante was one of the best weeks of my life and I enjoyed it a lot more than I thought I would. I met so many amazing people and would give anything to do the whole week again! Have you been on a party holiday before? Or are you planning to go on one this summer?